St. Scholastica’s Arizona campus will take a leap forward in January, offering a B.A. program in social work that’s designed to meet the needs of working adults. Applications are being accepted through Dec. 1. The flexible hybrid format combines online classes with occasional in-person meetings on partner community college campuses. Students will also have the opportunity to prepare their professional careers in gerontology and healthcare through additional certificate options. Leading the College’s first on-ground program in Arizona is Marcia Runnberg, a 20-year faculty member and pioneer for innovative learning programs in social work. The goal, she says, is to provide non-traditional adult students the opportunity to obtain a professional social work degree when it might be logistically impossible otherwise. They will also be prepared for advanced standing in graduate social work programs. Runnberg has a wealth of experience in starting new academic programs at partner colleges. Under her leadership, the College has already created flourishing programs at several community colleges across Minnesota. “We’re continually developing partnerships and creating community-based networks that engage two-year colleges, students, community service providers, and their constituents through a learning community model,” Runnberg said. St. Scholastica is also known for its small class sizes and individualized learning plans, which help students get the personal attention they need to master the material. Pair that with 570 hours of field experience throughout the Phoenix area, and students will be fully prepared to make a difference from day one. The College also features a seamless transfer program, and students can complete their degrees in just two years. Runnberg has for years led many experiential learning trips in Arizona and Mexico with her social work students, who studied the real-life consequences of the U.S. immigration debate. 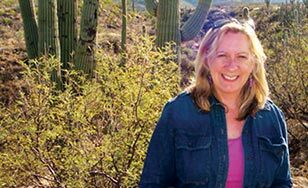 She spent a sabbatical in Arizona in 2010, doing research, writing and making professional connections. One such connection was with the Jesuit Refugee Services-Kino Border Initiative, in Nogales. “She’s very energetic, and really wants to help students have the fullest educational experience possible,” said the Rev. Sean Carroll, executive director of the Kino Border Initiative. Runnberg’s innovative work provides real-life experience to the next generation, he said. “This can really have a significant impact on what they do in the future, whatever their vocation may be,” he said.